"Is Confession a Time for Spiritual Direction?" "Is Confession a Time for Spiritual Direction?" In his seminary days, St. Alphonsus was strongly opposed to the idea of making confession into a time of spiritual direction. “After all,” he said, “there is only so much time; and if the priest gives too much advice, many confessions will go unheard.” St. Alphonsus saw spiritual direction as integral to the work of the confessor. Still, we simply must admit that confession is not spiritual direction proper and there is the realistic fact of time constraints. What will be necessary, then, is to discuss the occasions in which it is appropriate (and perhaps even obligatory) for the priest to give some spiritual counsel to the penitent without taking on the role of a therapist. Answering the penitent’s questions: Certainly, there will be times when the penitent has a question regarding the seriousness of a sin, or even as to whether a particular act is a sin at all. While the priest must be careful to keep the confession from turning into a simple conversation, a truly pastoral zeal should lead him to answer questions simply and directly. 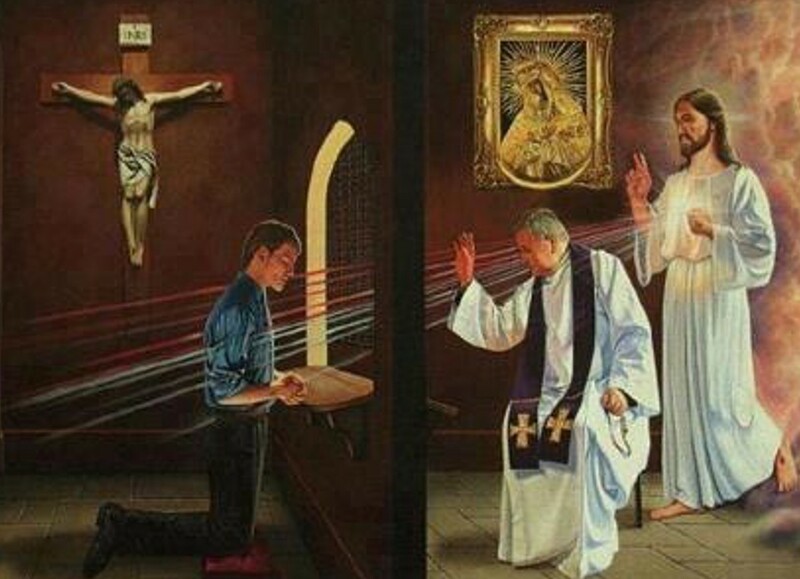 Penitents need to be cognizant of those who are also in line for Confession. Directing the penitent toward contemplation: It is the opinion of St. Alphonsus and of the best of the doctors of the spiritual life that the confessor ought at least occasionally to question the penitent regarding his interior life and, generally, to offer at least some advice, direction, and encouragement. When a penitent has overcome mortal sin and is generally living in the state of grace, it will be essential to his spiritual growth that he begin to practice regular meditation; for instance, the Rosary. Likewise, as the soul grows into closer union with God, the Savior will lead the penitent more and more toward contemplative prayer: thus, the faithful servant of Christ will eventually be brought into the dark night of the senses (on the verge of the purgative and illuminative ways). At this time, especially, it will be necessary for the confessor to question and advise the penitent regarding personal prayer. St. Alphonsus states that the confessor is a father, a physician, a teacher, and a judge. Especially in his role as father and teacher, the confessor must be ready and willing to direct the penitent through periods of spiritual dryness and toward the life of contemplation. Here, we must mention that the good confessor will move the soul toward contemplation neither too quickly nor too slowly. Confession as a universal avenue of spiritual direction: It is said that St. John Vianney could hear the confessions of grave sinners who had spent years away from confession in not much more than ten minutes. Certainly, most priests will not be quite so wise as the Curé, hence we should not be surprised if a confession occasionally takes more time. Still, in general, we can safely say that the questioning and directing of penitents should not usually be a grave burden on either priest or people. In any case, the lay faithful generally want the direction of a holy priest–and they deserve this guidance, since Christ has entrusted the duty of pastoring souls specifically to priests. Therefore, it will be necessary for priests to give some level of (informal) spiritual direction to penitents in the confessional. For the full article, please click here (X).